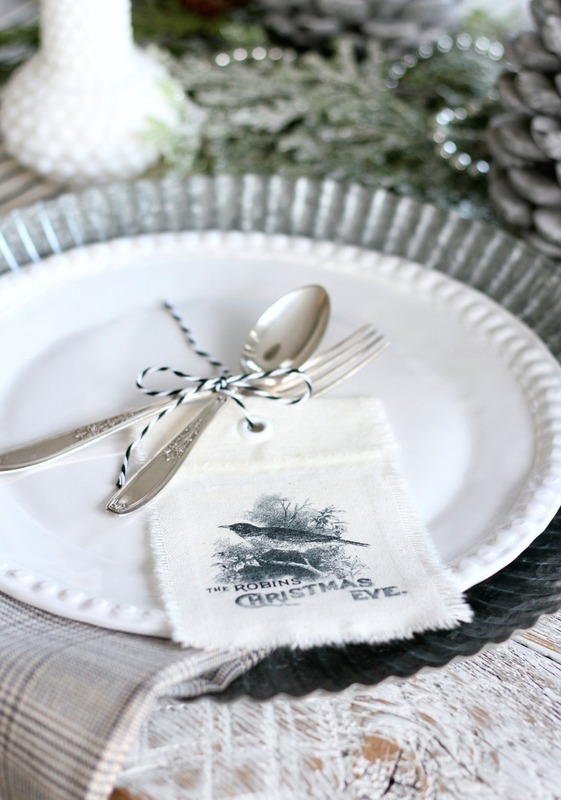 These vintage Christmas gift tags are an easy way to dress up plain craft paper wrap. Get creative with the images you choose to print. So fun! Do you enjoy wrapping Christmas gifts as much as I do? At the end of October (or sooner), I start thinking about what my theme will be for the upcoming season. Last year, it was a mix of natural, black & red with handmade chalkboard gift tags. This time, I decided to stick with neutrals (black, white & cream) and add a bit of vintage and greenery for a classic, natural look. 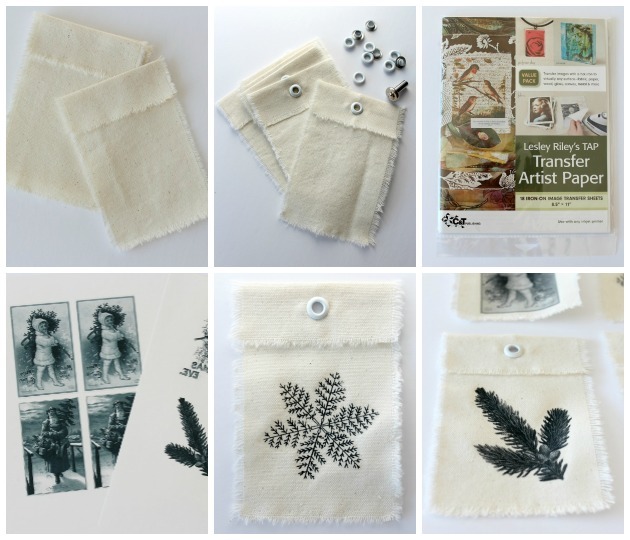 To embellish gifts this year, I decided to make some vintage canvas gift tags. They do a great job of dressing up plain craft paper wrap. I already had the supplies on hand (which was a life saver because I really didn’t want to trudge out in the snow and deal with the extremely cold weather we had over the weekend)! 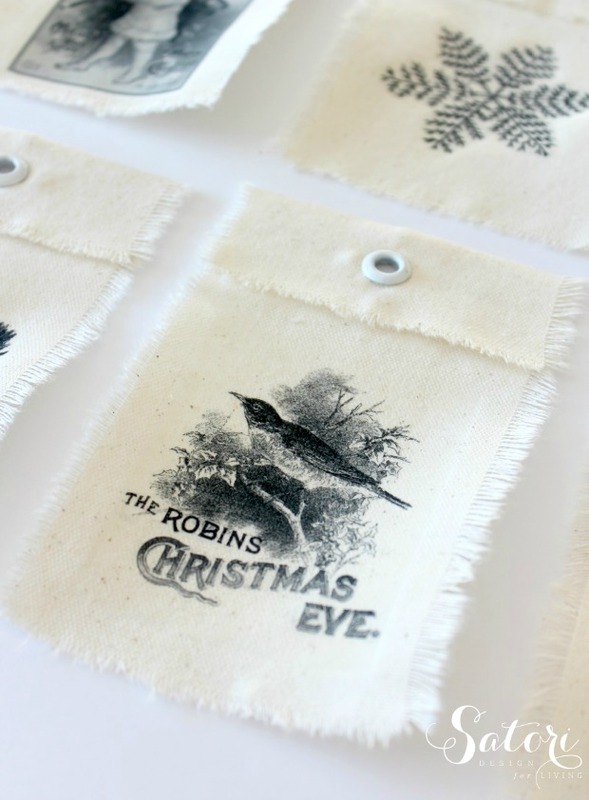 If you recall my Valentine’s Day treat bags, the method for making these vintage Christmas gift tags is similar. Some affiliate links are included for items I personally used for this project. Check out my blog policies here. string (I used baker’s twine and jute). You will also need a hammer, scissors, inkjet printer and an iron. My tags measure about 4″ x 6″ (after being folded at the top), but you can make yours any size you’d like. Adjust according to the size of the graphic you want to use. To make things easy, I simply ripped cotton canvas into lengths. Mark your fabric and snip a bit with your scissors, then rip. Fray each edge evenly by removing some of the threads (trim with scissors as necessary). Fold each one over at the top, press in place with the iron, and add an eyelet at the top for the string to go through. 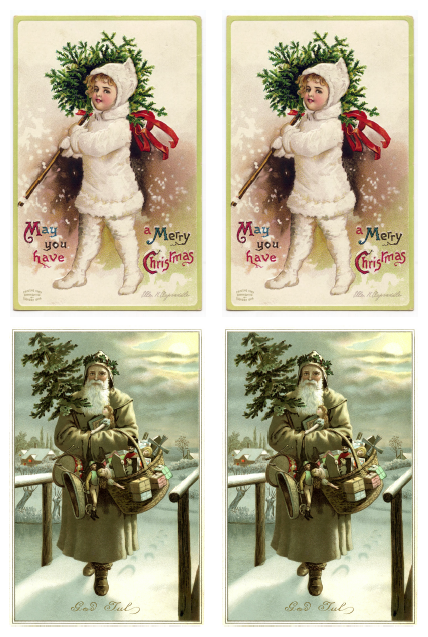 The vintage Christmas images are available for free from The Graphics Fairy. **Remember to print in mirror image and black & white if that’s the look you prefer. 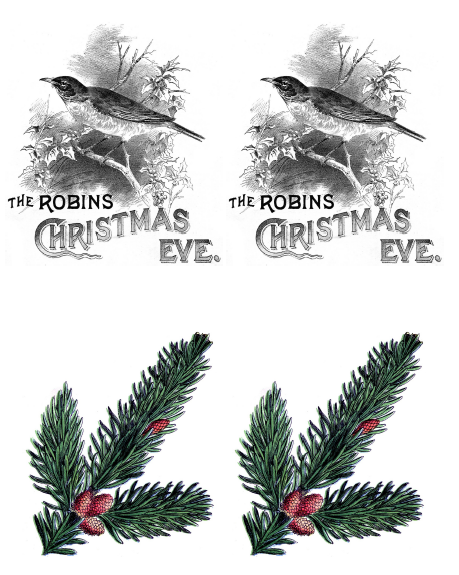 Simply click on each image grouping (4 per page) to download and save as a PDF. 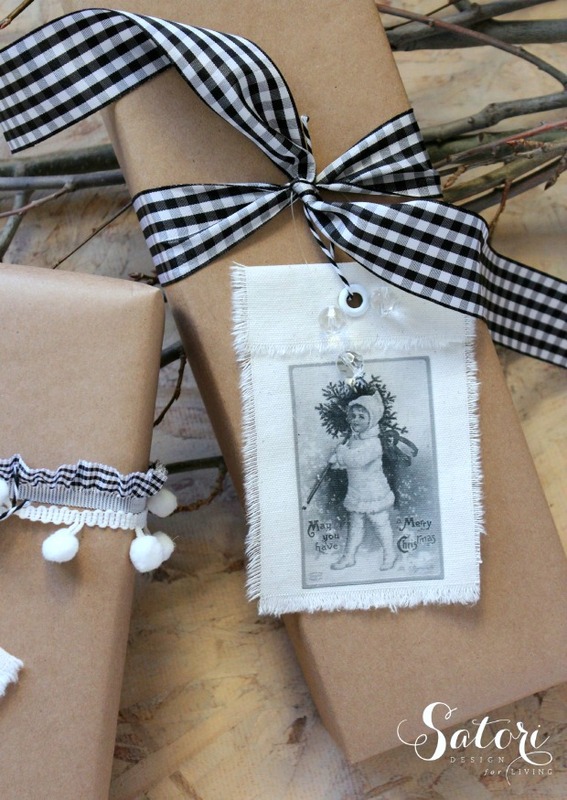 I think my friends who love the vintage or shabby chic look will appreciate these gift tags. They add a nice handmade touch, don’t they? Tie on a little string and they’re ready to embellish gifts. As an option, you could also hang them as ornaments on the Christmas tree or pretty much anywhere else you want to decorate. Pretty as Christmas table decorations too. Digging the vintage vibe? 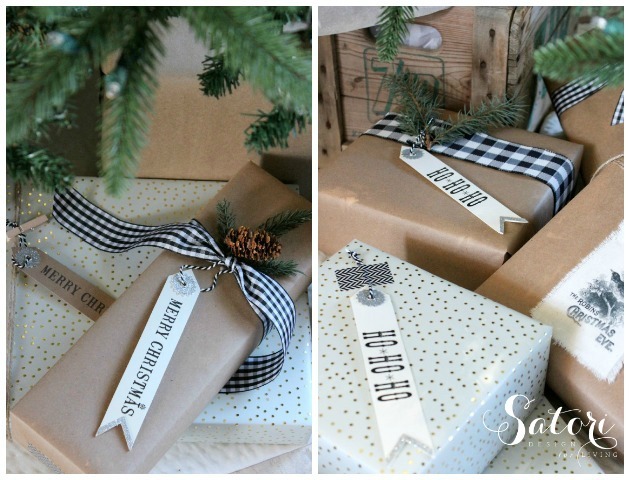 Check out how my entire gift wrapping scheme came together! 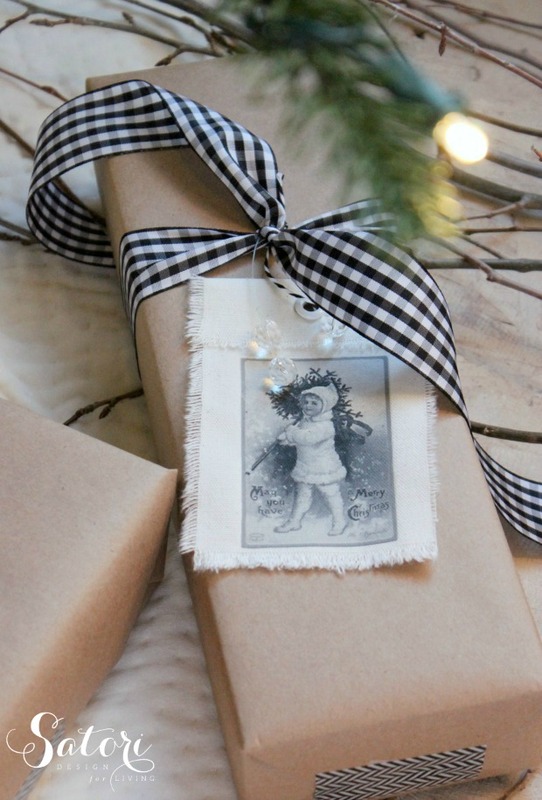 Now for more Christmas gift wrapping inspiration! 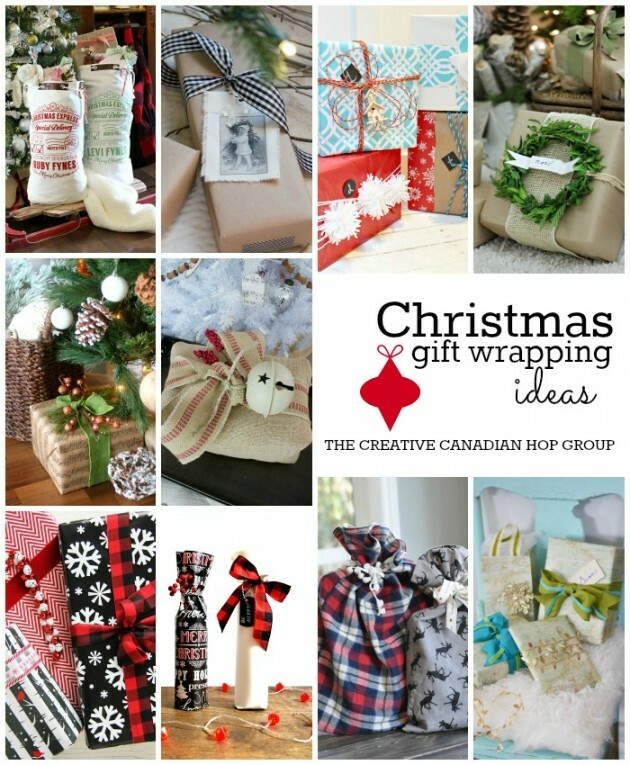 My friends from the Creative Canadian Hop Group are sharing some of their beautiful projects today. 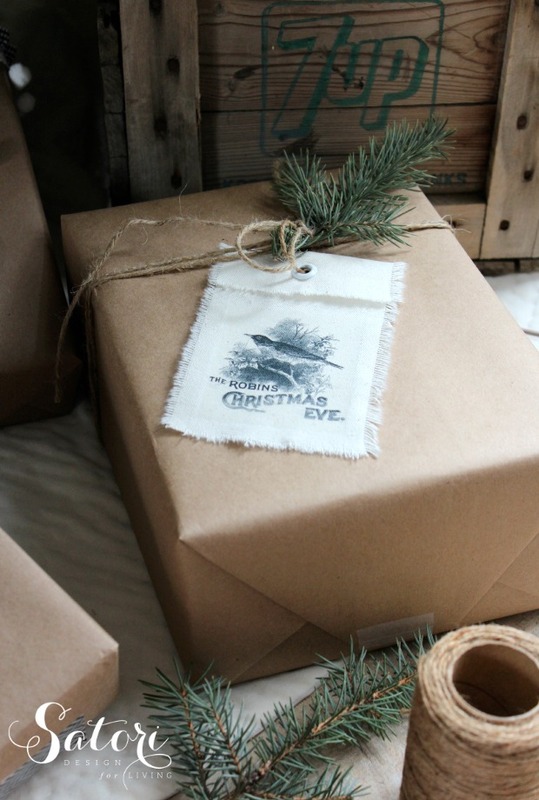 Hope you enjoyed our Christmas gift wrap ideas! « Our Favorite Things Giveaway! These are beautiful Shauna, and such a great idea! I have never thought of doing this…thank you for the idea – it’s fantastic! Thanks, Jo-Anna! It’s those little touches that make gifts special, right? Oh My Goodness!! I’m dying over here. I love, love, love them Shauna. I’m definitely going to share these! Thank you so much, girl! I had a feeling you’d like them! These packages are so beautiful, I wouldn’t even want to open them! 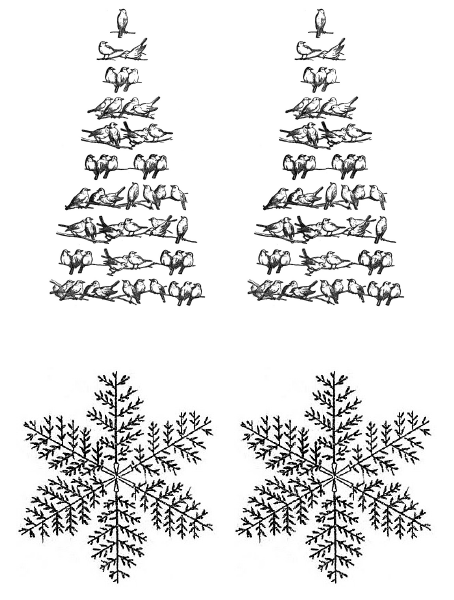 These are lovely and it’s so nice that you made some prints available for others to use to make their own vintage Christmas gift tags. I especially like the way you kept it neutral almost modern looking mixed with the vintage printed. Very updated. Thank you, Patti! I’m thrilled with how they turned out. That iron-on transfer paper is amazing stuff! Perfection! Loving those gift tags so much! Thank you! You should give them a whirl, they’re super easy! Those are really cute! Love the neutral colors, too. Eeeeekkkk, HOW did i miss this!? LOVE! Thank you for stopping by, Laurie. Enjoy your day!